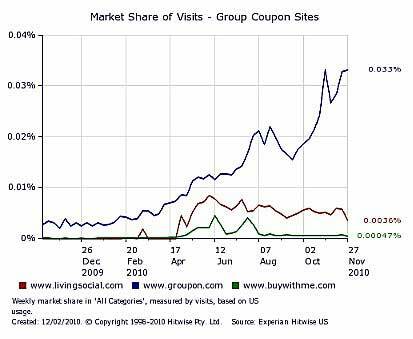 Fast-growing Groupon is enjoying prominence in the social deal-making market, accounting for 79% of US Internet traffic to group coupon sites for the week ended November 27, 2010, while second-ranked LivingSocial received just 8%, according to Experian's Hitwise Intelligence. Among a custom category of 81 group buying sites, Groupon received 5,928,683 total visits during the week ended November 27, accounting for 0.033% of US Internet traffic during the period, while LivingSocial received 633,828 total visits (0.0036%). Though it appeared in the spring of 2010 that LivingSocial's visit growth might threaten Groupon's dominance, that growth-spurt was short-lived. Now, LivingSocial's market share is almost an order of magnitude lower than Groupon's.